Amateur photographer Andrew Devey got more than he bargained for when he was looking for the latest phase of solar activity. 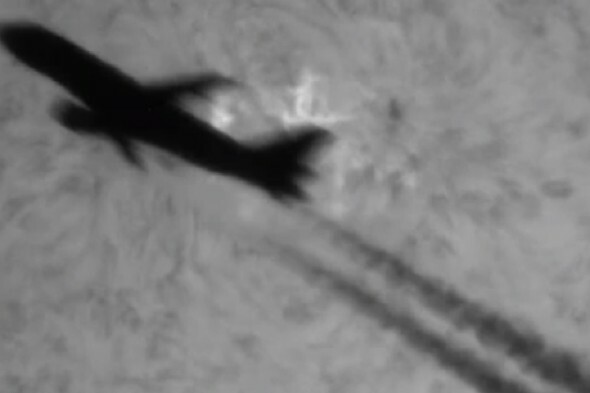 As his camera was trained intently on the sun, a passenger plane flew right across his view, creating an amazing 'photobomb' as the jet's silhouette and its contrails pass over the solar surface. According to the Daily Mail, Mr Devey, 56, has been an amateur stargazer for around seven years, and uses a telescope and cameras to capture images from his back garden in Barnsley. These stunning pictures and time-lapse video were uploaded to The Solar Explorer, and are being viewed by millions of space fans. Mr Devey said: "I was filming a large active region when a plane shot through my field of view." The Sun's surface activity - known as the solar cycle - is the periodic change in levels of solar radiation and ejection of solar material, as well as changes in the number of sunspots and flares. Solar cycles have a duration of about 11 years, and the pinnacle of the latest one is due later this year, reports the Daily Mail. Melissa Brandts and her husband on holiday at Lake Minnewanka in Banff National Park. This image was taken on a remote camera on wheels.